Wind power is a renewable resource that has exciting potential for the future. Wind is created by the sun’s uneven heating of the earth’s water and land surfaces. Land absorbs more heat than water. As long as the sun shines, the wind will blow, creating a source of power or electricity for our use. Today modern wind turbines are appearing on our horizon on land and on sea. As with any source of energy, there are advantages, disadvantages, and challenges to using the wind. Wind turbines can be loud, troublesome for birds and neighbors. However, wind is free, and clean, making it an increasingly important source of energy as countries across the world set goals for a more sustainable future. Wind blows. While March is considered by many the month that comes in ‘like a lion’, winds are constantly moving across the surface of the earth all year round. Wind is moving air. Sometimes we can see the effect of wind on waves in a lake or clouds moving in the sky. What other ways do you have of telling if the wind is blowing? The sun heats the air when it shines on the earth. Land heats up faster than water. Cool air moves over the water and onto the land. Warm air rises over land. Draw a diagram of air movement over land and water dotting warm air red and cooler air blue. Be sure to show the sun! Activity 2 – Capture the wind! Design and make a mini wind turbine (pinwheel). If possible, try reusing existing materials such as paper from an old magazine or newspaper. You will need a straw, a push pin, a square piece of paper, colored pencils or markers and scissors. First cut out a square from your magazine/ newspaper or paper. Color both sides. Next fold your square corner to corner; using your scissors, cut into each fold about 2/3 of the way toward the center. Now fold every other fold into the center of your pinwheel. Put a pin through the points of the center through your paper into the straw. Test your pinwheel by blowing on it. Now take your pinwheel outside and catch some wind. Where does the wind blow? Where does the wind blow the strongest and longest? Take a look at the following Interactive Energy Map. Find the state that has 4% of its power from wind. What state powers more schools from the wind than any other? Now identify three locations in the U.S. that could be used for wind farming. Remember that wind farms can be on both land and sea. Consider the wind potential and access to the power grid. Take into account how the wind farm may affect its neighbors. Write a short paper about the importance of wind power and propose a new wind farm near your community. Charles F. Brush, one of the founders of the American electrical industry built what is thought to be the first automatically operating wind turbine. 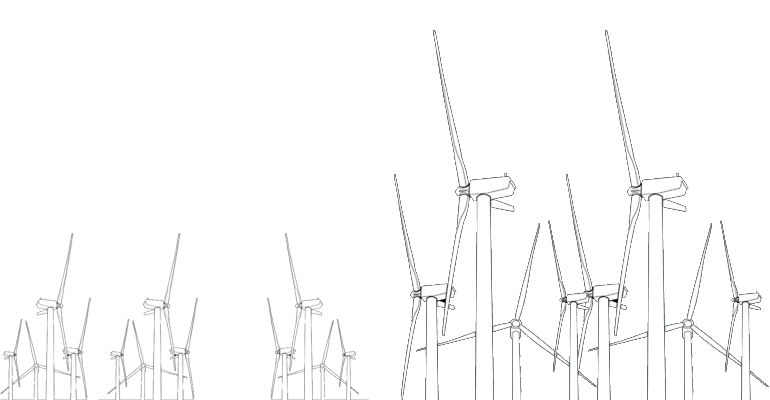 Considered the world’s largest at fifty feet in diameter with 144 rotor blades, it surprisingly only generated enough to power batteries at 12 kW. Dane Paul la Cour is credited with learning that fewer rotor blades turned more quickly and created more electricity. Using this wind turbine diagram, make a sketch in your journal and label the parts of a wind turbine. The tower provides the structural support for the rotor or turning blade. The foundation secures the tower to the ground, ocean floor or building. The nacelle connects the rotor to the tower and allows it to turn with the wind. The transformer changes the turns of the rotor into electricity. Research the different types of wind turbines and the electricity they generate using the Internet. Document at least five different kinds. 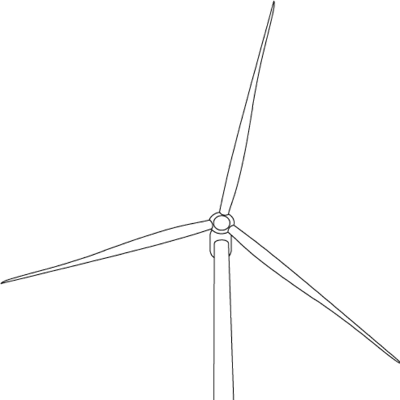 Surprisingly, turbines can be oriented horizontally or vertically. Some are open, some enclosed. Some have rotary fins while others have spiral fins. Look at different manufacturers of wind turbines and compare their cost, energy output, and material make up. 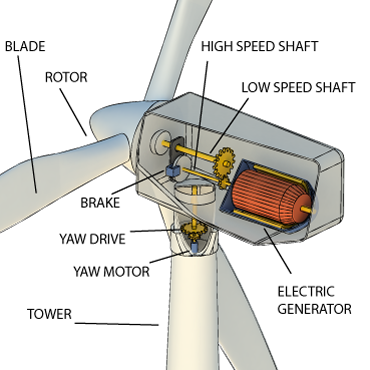 Then, sketch your own wind turbine design with each of the five main parts: tower, nacelle, transformer, rotor, and foundation. Can you think of ways to improve a wind turbine? Will you use new materials? Will you generate more electricity? Will you choose to give a vertical wind turbine a new look? Will you be using a number of small turbines or one larger turbine? Write a paragraph about your turbine concept, describing the basic idea and how the wind turbine will affect its surroundings and contribute energy to the community. Wind farms have to be located on land. Wind power is a form of solar power. The following country is one of many taking steps to use more wind power. Wind turbines or wind farms can store and provide energy for entire neighborhoods. Ask a Biologist A WIN-WIN With the WIND!